And of course, using a Bluetooth TNC, etc, is going to be much more reliable than this hack. I don’t use this on a regular basis. Finally, this cable seems to work well on my Samsung Galaxy Nexus, but is not detected as an output by my Nexus 5x when plugged into the radio so it might need different resistor values or connections depending on your devices. Your wire colors may be different; I made this diagram match the wire colors from my cable so I wouldn’t get things confused. I’m sure there is some science behind the correct resistor ohm values (and as in the Github link, an additional capacitor might help; I’m not sure, this is just a hack.) I used 480ohm resistors. The idea is to mute the audio slightly because amplified earphone output being wired straight into amplified microphone input is a surefire way to transmit nothing but distortion. 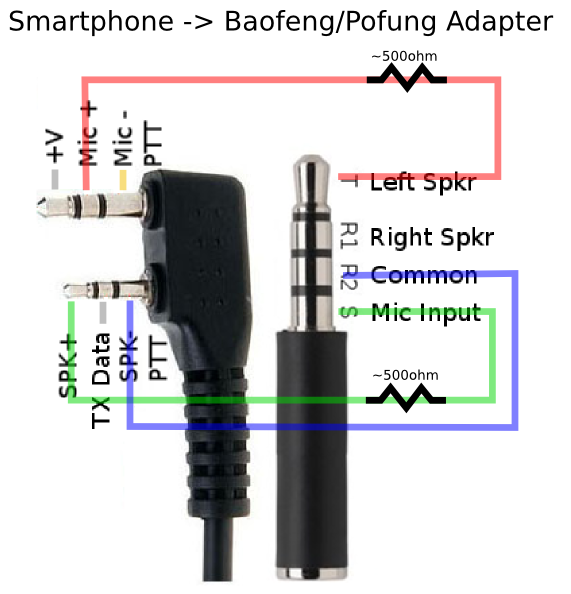 In my experience on a Galaxy Nexus running APRSdroid with this cable into a Pofung UV-82, the best reception is with the radio volume at barely audible (1/3rd of a rotation) and with the phone volume at 1/4. Further experimentation would yield better data, but keeping an eye on received packets and repeats of your transmissions can help you even if you don’t have a separate radio to listen on. You can also use a recording app on your phone to see what the phone is hearing. Helpful settings on radio: VOX at ~2, Squelch at ~1. Ensure that both channels are set to the APRS channel before enabling VOX or connecting cable, and connect the cable while radio is off, to avoid unwanted transmission. Consider listening/testing your transmissions/receptions on a separate radio and looking at the radio’s receive/transmit lights to ensure that the phone is being polite and not transmitting over other stations, and is actually audible. I’ve been trying to do this for awhile. Would you be willing to build me one if I paid for it? Not your usual type of article, I’m impressed! Of course I’m usually impressed, but this is completely different. Great job! Thanks for your write-up and schematic! I successfully made the same cable yesterday, and tested last night. It took a few minutes but I did eventually receive APRS data (other objects, repeaters etc) on my phone while connected to my Baofeng UV82L. I followed your suggestions for radio and cellphone settings. I was also able to see myself on aprs.fi after quite some time. However when I listen to my own radio with another handheld nearby on 144.390, when my radio/cell transmits, all I can hear is a very very subtle hum and a couple clicks (not the usual aprs data squeal). Any thoughts why? I tried playing with volumes on the radio and phone, none made a difference. I double checked my cable too, it all checks out according to your schematic, including the ohms across the resistor added lines. Thanks, I will try that and report back! I was also considering shorting the resistors, so that the signal was stronger from phone > radio. Yeah I don’t think that’s it though. I think the resistor might also help with your phone detecting the cord as an input and output, too. And you don’t want to overload the amplified microphone inputs of the radio / phone. Ok. Perhaps its the cables that I used, I just used what I had laying around. I’ll try ordering the same ones you used and see how they work then. I built this cable using baofeng’s over the ear microphone set(came with my UV-82HP). I was never going to use as it was. Then I used a 3.5mm 4pin to composite cable with the composite ends removed(it came from a failed experiment with Sony FD-20). I then soldered onto the tiny pins of the microphone circuit board that I cut off all but what was needed with my dremel. Soldering to those tiny pads was not easy. I used my soldering set to my default of 350*c and a chisel tip and never would have done it without my helping hands. Being careful paid off. I then enclosed the wires and the last piece of circuit board back into the housing which held the microphone and dual ptt buttons. Hopefully I can get the aprs passcode and test my work tomorrow. I just got licensed into the world of ham so everything is only just beginning to get torn apart and modded! Cool! FYI I don’t think the passcode is necessary unless you want to connect to the Internet Service (IS). If all you want is to listen and transmit over the radio, then setting AprsDroid accordingly should be all you need. So I got it working. Somewhat. I can receive through the the radio tons of different items and can look at the map for them. But I cannot transmit through the radio. I turned off wifi and cellular date to test. The app looked like it was transmitting but aprs.fi did not show me. When I use the ptt on the radio with my phone connected as soon as I release my phone then says headphones connected. It’s like when the radio transmits the phone doesn’t see headphones. Any ideas? I may try this on my dads baofeng(same model) to see what happens. Triple-check your wiring, and maybe fiddle with it a little bit; each phone may have a slightly different method for detecting headphones vs headsets, and you need it to detect as a headset before and during PTT (and during noisy reception.) Most phones do this by checking the resistance between two or three of the pins, for example the MIC GND vs the SPKR GND. If you’ve accidentally/naively connected these together in your cable, it will cause intermittent/unexpected operation. Also note that 100% of your transmissions will not appear on APRS.FI. First you will want to check (perhaps on an unused simplex channel, my favorite being an FRS or GMRS frequency at the lowest possible power, perhaps even without an antenna attached) that the transmission volume is appropriate, without clipping. Use a second receiver and/or record using TapeMachine on your Android to see if your output and input volumes are appropriate. Lining up earphone outputs with microphone inputs is a major hack, it will take some fiddling and testing. You don’t want to flood the airwaves with garbage interference. Then perhaps try holding that second receiver up to an APRS decoder (second Android phone?) and see if you can decode the transmission. The final test would be to repeat the experiment, except at full power with an antenna and a few thousand feet of separation between transmitter and receiver. My cable was not shorted. I reopened it and try shorting m- to the common. The radio then starts transmitting. I then tried a 4.7kohm resistor between m- and common. It still wants to. I’m thinking it’s just the radio is not a good one for this. Oh well. At least I can still use aprsdroid without the radio. But the radio is what makes it cool!